The kids love water and were thrilled when we told them we were visiting a water theme park while we were in Phuket. Splash Jungle was our last stop before flying back to Singapore as it is located near the airport. There were more then 5 different slides for adults and some of the rides were of real high intensity level which can really rival any roller coaster ride which you may have been on. One of the scariest water ride which I have been on to date with it’s almost vertical drop. I literally had to cling on to the handles on the float to prevent myself from being flunk off the ride. Monkey boy loved the ride and went countless times on it. I only took it once and it was enough for me. While Monkey boy and R were trying out the thrilling rides Doggie boy and I checked out the kids play area. Doggie boy was too short for the extreme rides so he had to settle for the kids area and the shorter tube rides. He loved the white tube ride and made me go with him countless times on a double float. It got really tiring for me after a while as I had to drag the double tube up 3 flights of steps each time he wanted to go for a ride. After like the 6th or 7th time I told him that I wanted to take a break and we could go on the non tube rides instead. Doggie boy also love this slide down at the kids section and went countless time down it while I tried to snap his picture. It took me about 4 attempts before I cold get this clear shot of him with the Olympus Tough camera that we specially brought along to take pictures at the water park. This is one of the most relaxing ride~ the lazy river. It is much longer then the one at the CSC pool that we frequent and there are more waterfalls and other water features that one would pass through on the ride. You can see all the rides in action by viewing the video of the park below. It was certainly a lot of fun for us and the kids want to go back there again the next time we visit Phuket. Looks like fun. There is a new waterpark in my city. Although it is not as huge as this, it has water slides for kids. I am excited to bring my nephew there. Swimming is the last thing on my mind. While it’s not frigid yet, it is definitely too cool for swimming. lol Great photo opportunities, though! Thanks for linking up with Monday’s Music Moves Me! It looks like you had lots of fun. 🙂 I can’t swim so I’m not too keen on water parks. My kids love the water though so we do take them to resorts once in a while. But I really can’t imagine myself going down those tubes. Oh my goodness, so much fun! TAKE ME AWAY! Thanks for sharing. Love Love Love your Christmas Carol with such beautiful voices. MERRY CHRISTMAS and thank you for joining us!!! Great photos of a great time! I didn’t know there were water rides with an almost vertical drop; it’s been a long time since I’ve been to a water park and now I want to go! As always, beautiful music selection as well. Wonderful Christmas song medley. I just sat back in my chair and enjoyed the show. The kids were darling, and the lead singer has such a beautiful voice. Thank you so much for sharing this with us today! My husband hates me for not loving the sun. I’m so vain to have a dark complexion. The unfair thing about my family in laws is that even if they stay for a long time under the heat, they will still be white and will just turn pinkish. Unlike me, ugh! But believe it or not, I even went for a swimming lesson when I was in 1st yr HS. 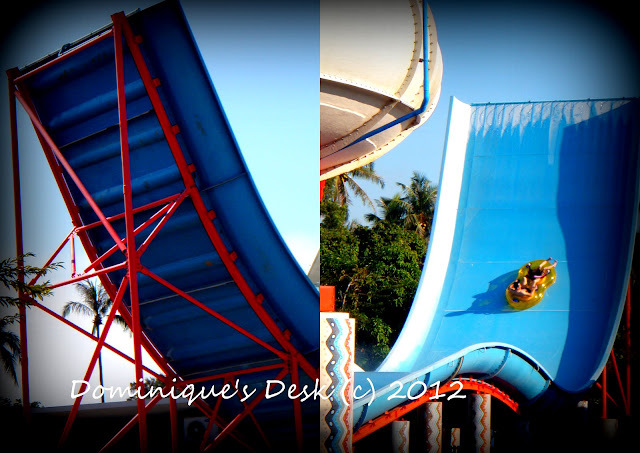 Those slides look so scary hehehe! I Love it! The kids so cute too! Call me chicken, but after one “vertical” attempt with my kids before, it scared the hell out of me. All the “What ifs, What ifs!” haha. My kids (or is it most kids) like to play daredevil. I will take note of “splashjungle”, seems like an interesting place for kids. Did u carry the wet swim wear up the plane? Glad you had such a wonderful time with the babies. My kids would love to visit a waterpark again! Love the photos and music.